On Jan 1, 2018 I (Crystal McMichael) get to ring in the New Year in the best way possible by heading off to the tropics to do fieldwork! And this time I get to take two students with me. Britte Heijink and Veerle Vink are both in the Biological Sciences MSc program (Ecology and Evolution track), and they are going to work on research projects that are associated with a recent grant that I was awarded through the Smithsonian Tropical Research Institute CTFS-ForestGEO Research Grants Program. Veerle examines a cliff exposure during the Palaeoecology course, and has loved microfossils ever since! Britte (far left) raises her first sediment core during the Palaeoecology course in 2016! The project involves collecting soils from the San Lorenzo (Sherman) forest plot in Panama and the Amacayacu forest plot in Colombia. Britte and Veerle are going to analyze charcoal, which provides evidence of fire, and phytoliths, which represent vegetation, from the soil-surface samples. They are going to compare the phytolith assemblages with the modern vegetation observed within the plot to establish a phytolith calibration dataset. They are also going to look at charcoal and phytoliths from soil cores collected within the plots to then quantitatively reconstruct past fire and vegetation change using the calibration datasets that they generate with the surface samples. It’s going to be a lot of fun! 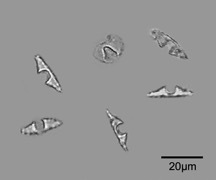 Heliconia phytoliths are commonly found in soils and sediments and indicate past openings in the forest canopy (disturbances). Britte and Veerle both did the Palaeoecology course and Tropical Ecology courses at the University of Amsterdam that I teach with William Gosling and Joost Duivenvoorden. They also did their BSc thesis with us in palaeoecology, and both have experience working with pollen and phytoliths. And they also just completed our new Environments Through Time course, which was brand new this year! Happy Holidays everyone! Britte and Veerle are going to keep you posted on our travels in the tropics in future blog posts in the New Year!